Update the glorious bread brand’s website to coincide with a new in-store campaign. In 2017 Vogel Bread founders Nicholas and Harris were looking for improved user experience, imagery and the look and feel of their site. They were particularly keen the mobile friendliness of the site should be enhanced, with easier navigation and a smooth experience for both admins and users. The launch was to coincide with the arrival of promotion packs in-store, which we also photographed. Our aim for the design of the site was to retain the retro, quirky brand personality whilst injecting a freshness and more natural feel. It was to stay true to the core Vogel’s principles, set by their founder Alfred Vogel, of simplicity and naturalness. 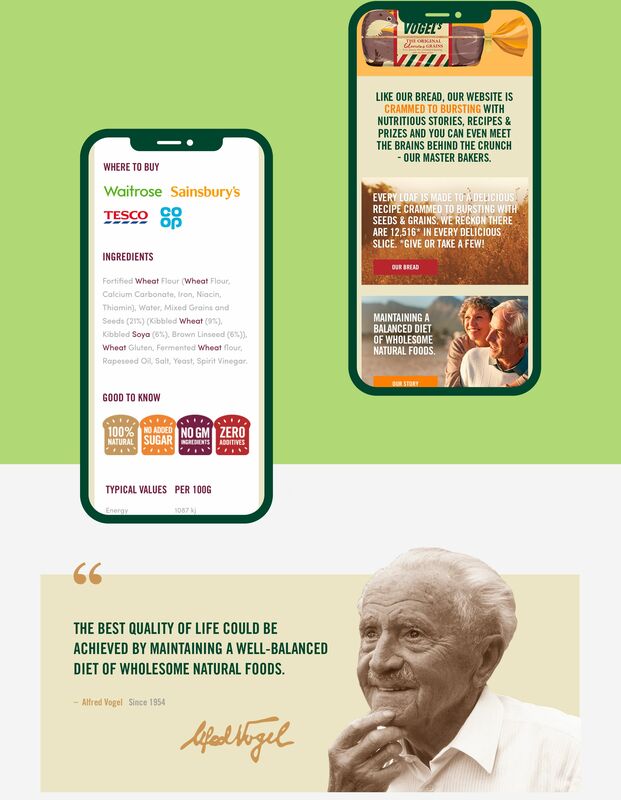 To dial up the brand’s “keep exploring” strategy and affinity with a love of the outdoors, we produced a look and feel that suggested countryside walks followed by cheese on toast; creating an emotional resonance with the audience with images, graphics and language. Working within strict brand guidelines, we also worked to make sure the site was fully mobile responsive and added a promotion switch on and off feature.